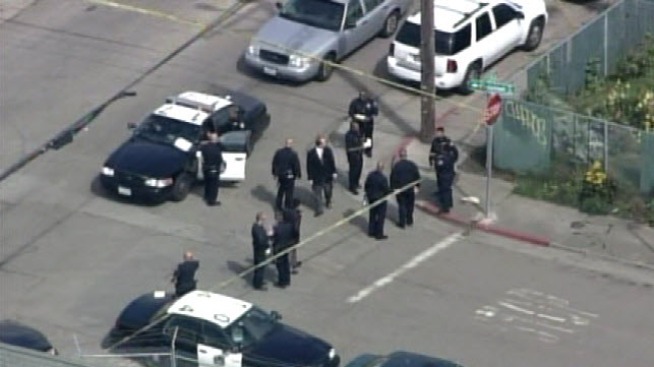 Oakland police are investigating a shooting involving one of their own officers. Police received a call around 2:30 p.m. Friday about a robbery in progress on Chestnut Street. After officers set up a perimeter in the area, police said two armed men were coming out of the house in question. One suspect was carrying what police say appeared to be a glock -- the other was carrying a knife. An officer fired a single shot hitting one man in the shoulder. That man is in the hospital and the other man is in custody. The shoulder injury is not considered life threatening. Police said the gun the wounded suspect was carrying turned out be a replica. The suspect also had a criminal record for burglary, according to police. Police believe the residents were not home at the time of the incident. This is Oakland's second officer-involved shooting this week. On Wednesday night, a teenager was grazed by an officer's bullet. Police released a photo of the weapon. (See right).